The Nelson contemporary bedroom collection is made from beautiful, warm American black walnut, quarter sawn to showcase its magnificent grain pattern. The tufted headboard provides superior comfort and comes in a variety of fabrics and leathers. The Nelson bedroom includes bed, nightstands and dressers. Though wonderful in its natural finish, the wood can be stained in your choice of various available colors. The Nelson contemporary bedroom collection is made from beautiful, warm American black walnut, quarter sawn to showcase its magnificent grain pattern. Its pieces are designed with original details and the composition of its shapes is visually appealing. The headboard has a lower wooden section and a buttonless tufted upper section. Its slight angle provides superior comfort leaned onto from a seated position. The top part of the headboard extends to the center of each night table. Various upholstery fabrics and leather options are available for the headboard. The bed frame comes with either a wooden platform or Italian slats and does not require a box spring. 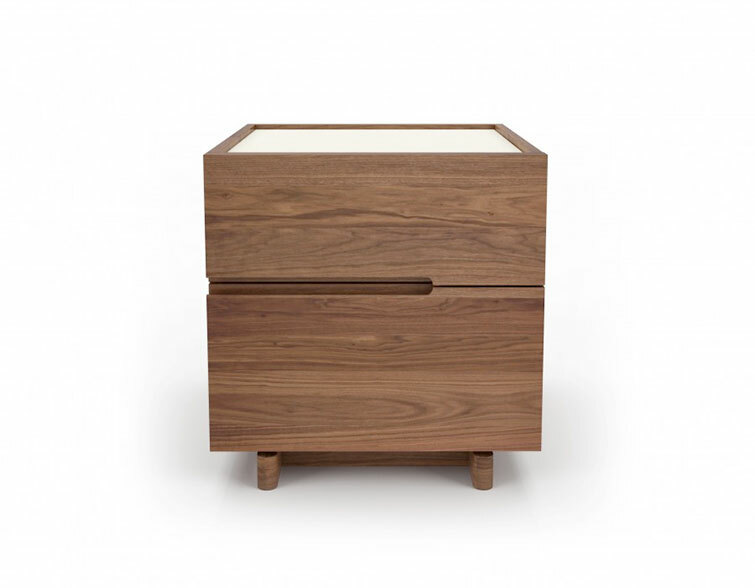 The Nelson bedroom collection includes bed, nightstands and dressers. Though wonderful in its natural finish, the wood can be stained in your choice of various available colors. Huppé Nelson Bedroom Collection Brochure: Use toolbar to turn pages, zoom, download and toggle full-screen mode. Huppé designs and manufactures innovative contemporary furniture offering clients a unique and distinct environment inspired by the choice, simplicity, and quality of its furniture collections.